Narayan 55 but still in the job. Inconsistency in the police revealed: one of Iowane Naivalurua's assistant commissioner's is 55 and still working - despite the decree that says he should retire. Naivalurua still has him on payroll. Ravi Narayan turned the magic age in June and senior officers are asking why he continues to work at Police headquarters as chief of staff. Bloggers will recall the retirement age in the civil service was set at 55 in 2009, the regime dropping it down from 60. Police officers who reached 55 have all been duly retired by the Police Commissioner so there's a lot of talk about Narayan continuing to be on the police pay roll. Narayan is one of six assistant commissioners and is very close to Naivalurua. 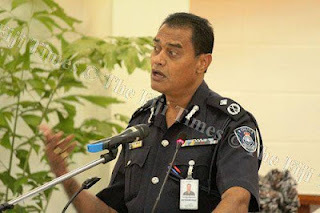 It was on his advice that Naivalurua sent four very senior officers, including chief operating officer ACP Henry Brown (he was also caught having an affair with CO 3fir wife and was sent on leave on orders from up top), on six months leave in March. Narayan turned 55 two months ago and was supposed to go on pre-retirement leave by April 2012, but he intelligently maneuvered Naivalurua into a one year contract until 2013. Ravi has been a keen supporter and was Director CID from Andrew Hughes' time. He was supposed to be sacked by Esala Teleni in 2010 after intel intercepted an email he sent from Sudan while on a mission to a few senior officers in police congratulating them on the plot to overthrow the commissioner. 2. Logistics unit: there will be no more accountability of police purchases and records. 3. Community policy: there has been a significant increase in crime after police community policy unit was disbanded. The retirement decree was introduced in April 2009 with an extraordinary gazette called decree number six and dated April 14 reverting the country’s official retirement age to 55, a decision confirmed by a Fiji Court of Appeal decision earlier that month. The decision was challenged by the teachers unions’ who took the matter to court and 55 was stayed by the Court of Appeal. “Notwithstanding anything contained in any written law, the retirement age in the public service shall be 55 years,” section 15 sub-section 1 of Decree 6 said. Why not just make the retirement age 40 ? That would save a lot of money for the Community and get rid all the people who oppose the Regime. Another option might be, to just simply get rid of the Regime and its supporters ! By the way, what happened to the young guy marrying the Pol. Comm. 's daughter, who, its alleged, was going to be spying on the Fiji Community ? Equal rights, I forgot to add, but some more equal than others. So much for weeding out nepotism and corruption and no jobs for the boys etc. Maybe I could get a job as an advisor or consultant to the Regime now I'm over 55. The trouble is though, I still look 45 ! Good on you Ravi. You are a good worker and the government needs people like you. On the oher hand government doesnot need people like Qarase. While the Europeans had been telling us to lookout for Indians taking everything- just like in Congo they were filling their pockets. Have u heard of Anthony Stephens, Stinsons etc? How about that Jeff Reed who told TUI TAVUA to have road blocks in 1987 as he did not accept DR Bavadra- ITS TAKEN TIME BUT WE HAVE WOKEN UP TO YOU THIEVES. iTS NOT ROCKET SCIENCE -why would a manager of a mine not want a change of government? At that time we all thought you were doing this for us BUT NOW EVERYBODY INCLUDING THE TAVUA CHIEFS REALISE -U DID NOT WANT THE LOOTING OR OUR GOLD INVESTIGATED BY THE NEW GOVERNMENT. One thing about the Itaukei today - We realise how people looted our country while setting up Anti Indian scenarios of them taking everything. Oh---how I miss Teleni--the Bafoon ! !Where the hell is he ?? --he had turned all the police stations into churches ! !----praise the lord !!! I feel sorry for our own people who have proved themselves in their professional career and are now working under this regime. The fact is that even with good intention and commitment with honesty, it finally comes to not because the cloud of confusion is all over the land. I feel sorry for our good and highly qualified individual who have cross over to the other side for reasons only known to them. Let's all hope that come 2014 a good and stable Viti will be established and people will understand and honor the dignity, rights and aspiration of of the people of the Land. Sa oti na gauna ni veicacati kei na veivakayagataki. Kalougata tiko na i Taukei ni Vanua of Viti. Coup 4.5 may be the Fijian first sectary at the NZ Fijian Embassy is about 60's.The IG needs some people from the dinasour era to keep it going. How gives two hoods about someone that just turned 55 is still on job? Do I smell some disgruntled ex civil servants here? Man get a life and move on. Lets be honest - the whole idea of the 55 compulsory retirement was simply moronic to begin with - now the stupidity of another of their napkin decrees comes back to make them look silly again. This is another reason why we have no rule of law - if the regime doesn't obey the laws it creates, why should anyone else? Can someone explain how Frank managed to fund upgrade to national stadium yet we needed funding from Oz for voter registration system? good info for the idiot illegal PM? That's one way for the police to cut down on too many complaints -- simply get rid of the complaint department! Why do people still think that this Corrupt Regime is going to suddenly deliver a free and fair election? Why is the constitution commission visiting only Fijian villages? The majority of people attending consultations in the urban centers are Fijians, and the majority of people making submissions are Fijians. Some are even attending and speaking at every session - the Fijian nationalists at least have organised themselves to bombard the Commission. And then the Commission's program is at Fijian village halls, Methodist Church Halls - are they not making an effort to encourage Indo-Fijians to make submissions?? The program takes them to Lau, Kadavu, Lomaiviti, Vanua Levu, all over Viti Levu, and most of it is at Fijian villages - why not Indian farming communities?? Can't wait till 2014. After the election, I will pass a legislation moving up the retirement age to 65. In order get optimum productivity, a person has to have experience, wisdom and capability. Now this comes with maturity of a human. Ravi Narayan was and is the first Fijian to conferred an FBI Agent, there is only one more.FPF does not have Officers with suuficient credentials to be conferred the FBI award any longer because they'd rather sit in their Offices, sift through files, gossip, leak internal information and cannot be counted on any longer. Congratulations to Mr Ravi Narayan and keep up the commendable work you've done thus far and continue to do so. Six Assistant Commissioners (ACP) of Police. Three thousand strong police officers. Large salaries paid out for a job 1 (ACP) can carry out. Has it been effective? Duhh.... Is there a need for 6 ACP.... Do you know there are two Deputy Commissioner of Police...Is there a need for that either. Small force.....Many high ranking officers and no constables to keep law and order. The many ACP and DCP are probably to spy on each other for the Commissioner.Stab in the back useless pigs. Once a respectible profession has turned into a mickey mouse force. wasn't your name on the list of police officers to be sacked endorsed my military council in 2007. You have been working against Pm and the boys from very start and teleni gave you another chance! It all comes back to hurt the current government of what you are doing. also same goes for compol and director operations Rusi ( Rusi is LQ number one boy - SDL). PM is stupid to keep all SDL supporters working for him - they will stab you in the back very soon !!! PM do you also remember that compol took leave before 2006 coup - only came back after 6 months .. he is a deserter ! Has he really been conferred "FBI agent" status ? This must be a world first ! FBI officers are recruited from the US citizenry. Only US citizens are badged as FBI officers. There are only 3 persons of Pacific islander heritage in the FBI as of today and Ravi Narayan is not one of them. When will Fiji Police do their duty to protect Fiji from the criminal clique within the RFMF that seized power from Fiji's lawful government through armed robbery? Its amazing for the likes of Mark Manning to come onto to this site and ply his greater than thou garbage upon us! Manning you quals do even get you to clean the toilet in Naboro! You reek of racisim which no mater how hard you try to hide always gets the better of you1 ! Every now and then you just let it slip no fault of yours. As for Consultants, Australia thru AusAid gives Fiji $20 million a year but guess what about 80%-90% goes back to Australia as you just use your dopy Consultants whose quals don't even match up to the required task! I suppose AusAid can use someone with your skills who has all these years conned his way thru Aboriginal Communities as an EXPERT! In Fiji we could assist you with whatever you would like to do as long as AusAid pays for your salary, we already have enough of the stupid relatives of yours in Fiji working for AusAid one more won't do us any harm!We want you money but we will decided whats to be done sorry maaate! RAVI NARAYAN FBI.....Fiji born Indian.....DUH ?!?! Anon 10.09am, 9th August - the burden of proof rests with Mr Narayan alas I'm under no obligation to provide that. Besides, the conferrment is personal to Mr Narayan. If Mr Narayan wishes to disclose evidence then it's his discretion. This, among other credentials and scarce skills requires that he is retained beyond the "retirement" age; like many other civil servants and Ministers including the Honourable PM. Anon August 9th 2012 and 2:59pm in other words its bullshyte. Just tell it like it is bro. Otherwise don't post statements alleging things you can't back up. Didn't see Ravi Narayan at the last Asian Pacific islanders bash. In addition to an Asian food tasting, New York Division employees were able to take pleasure in an assortment of musical and dance selections performed by guest performers: The Harmonia Opera Company and The Garden State Opera. excompol Savua's golf stick has it been found yet? It must be located and put in the police training facility to remind every fiji police men women and police dog of the fiji police forces failure to act professionally at the time of the Speight coup. The force is yet to demonstrate it has regained its once highly regarded professionalism. These days it's just playing second fiddle to the military mob. looking after the people of fiji is a secondary thing. the main thing is to keep the military masters happy. A very sad situation prevails in the police force. He began life as an ordinary midshipman on a paltry pay in 1975 but after his 2006 treasonous coup ordered Warrant Officer J. Degei, a low ranking officer in the military and the RFMF’s chief clerk, to hand over to him a cheque, authorised by his then illegal Finance Minister Mahendra Pal Chaudhry, of $184,740. 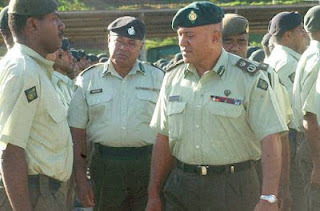 In total the military leader and self-appointed Prime Minister stole a whooping $205,147.29 from the taxpayers of Fiji under the guise of leave pay and other payments he claimed was due him for thirty years. Every organization has a policy of use it, cash it or loose it. It is never open ended. Frank stole this money. MPC was complicit in this, but being the Stalinist he is, he saw this as his opportunity to compromise Franky boy. Fourty thieves of Delainabua, the officer corp were also compromised. It has been all down hill since then. PEOPLE OF FIJI MUST UNITE AND FIGHT THE NEXT ELECTION AND END THIS EVIL BY THE REGIME. NO MORE GOSSIPING LAMULAMU SONA AND STAND UP FOR WHAT YOU BELIEVE IN. THIS HAS TO STOP. The United States suspended mil-mil relations with Fiji because of the coup, but bilateral law enforcement cooperation was unaffected by the sanctions and has actually increased since the coup. This is a good thing for the people of both countries. For the United States, it increases the interdiction of illicit drugs and other contraband before they can be transshipped to the United States. For Fiji, it increases local capacity to combat transnational crime and potentially improves the level of police professionalism. The Australian Federal Police maintains its ties to Fiji Police as well. The United States FBI Academy in Quantico, Virginia gives special training berths to promising foreign law enforcement offocers every year. I don't know if Narayan benefited from such a training opportunity, but it would certainly be a pity were an officer with such valuable training retired at the relatively young age of 55. Bainimarama will be respected and given the same respect and status as late Sir Lala Sukuna. He has been correcting the wrong,evil doings and corrupt practices of past. His name will appear in all future Social Studies books and the students will study about this much respected leader. He deserves a noble prize. Why wasnt CO 3FIR's kicked out of the Police Force like Brown ,shes still working at Nabua Police Station? Fijian nationalist like me? I'm your man!!! Why wasnt CO3FIR's wife kicked out of the Police Force,as of today she's still there!!! On 11 March 2004 Bainimarama acknowledged the letter of his appointment but he touched on the issue of a payment of gratuity and the required age to retire at fifty-five. “A common provision that has been provided to the Chief Executive Officers of Government Departments and Constitutional Office holders is a payment of gratuity, recognising the services of the office holder,” he wrote. “The position of Commander is much different in that, whilst other Constitutional Office holders or Chief Executive Officers are permitted to work until they reach the age of sixty, the Commander is required to retire at the age of five-five. We are of the opinion that it is only appropriate that the Commander be paid a gratuity at the end of his service the sum of two times his annual gross salary,” he stated in his letter. In other words, he agreed to the terms and conditions regarding the retirement age as well placing himself under the control of the Minister and to properly manage public funds approved for the RFMF by Parliament. But four years later, in 2008, he not only refused to retire under the State Services Decree (exempting himself), but collected nearly $45,000 in Gratuity payments, while providing a park to the 55 plus whom he has thrown to the dogs. What's that incident with the COFIR's police wife, who is she, and who is COFIR?